Editor Charles Rowley calls Gordon Tullock “an economist by nature rather than by training.” Tullock attended a one-semester course in economics for law students at the University of Chicago but is otherwise self-taught. Tullock’s background has enabled him to analyze economic problems with an open mind and to deploy his formidable intellect in a truly entrepreneurial manner. 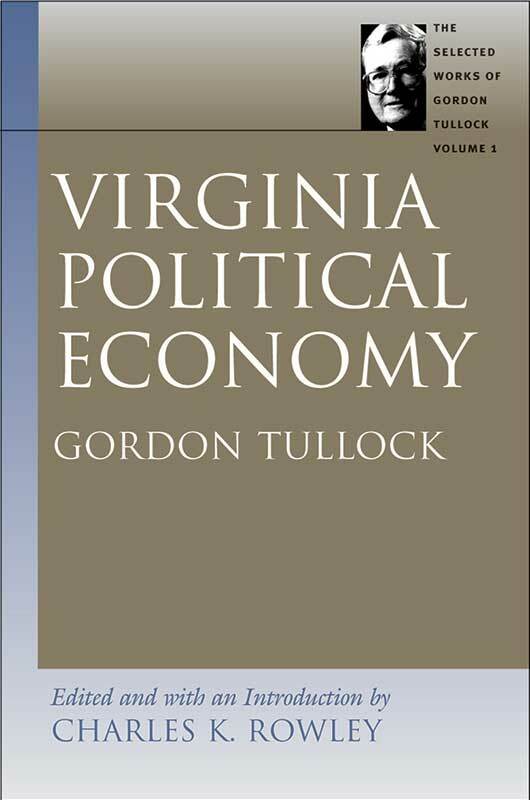 Virginia Political Economy is the inaugural volume in Liberty Fund’s The Selected Works of Gordon Tullock. The series consists of ten volumes of selections from the major monographs and scholarly papers published by Tullock between 1954 and 2002. The first volume contains a selection from Tullock’s published academic papers and essays designed to introduce the series and to offer a representative picture of his work to allow scholars to evaluate in depth the relevance and intellectual impact of his contributions. The volume begins with the only two pieces in the Selected Works that were not written by Tullock himself. The first is the brief assessment of Tullock’s contributions made by Mark Blaug in 1985 when explaining why he had included Tullock in his list of the one hundred great economists since John Maynard Keynes. The second is the short statement published in American Economic Review in September 1998, recognizing Tullock as a Distinguished Fellow of the American Economic Association. Introduction, biographical note, contents of the series, index.